F. A. Hayek as "Mr. Fluctooations"
In Defense of Hayek's "Technical Economics"
As reported in Alan Ebenstein's recent biography (2001), "Mr. Fluctooations" emerged as Hayek's nickname at LSE in the 1930s�because he so often used that word, pronouncing it each time with a heavy Austrian accent. And his lectures on industrial fluctuations were accompanied by a full complement of graphics that depicted the economy's capital structure and the effects of credit creation on that structure. One LSE student (Ben Higgins) lamented that the significance of the lectures was "buried in the cumbersome three-dimensional diagrams with which Hayek presented his ideas and which made them seem like something in the field of engineering" (Patinkin and Leith, 1978, p. 74). Whatever became of those 3-D diagrams and the insights they represented? Why did Hayek see the economy's capital structure as being so central to our understanding of industrial fluctuations? Just how did his ideas line up against those being developed by John Maynard Keynes? And why did Hayek eventually all but abandon the research program that had so energized him in those early years? The initial lectures that Hayek delivered at LSE in early 1931 set out his own understanding of Ludwig von Mises's theory of the business cycle. These lectures, which were the basis for his being awarded the Tooke Chair, appeared later that same year as Prices and Production. 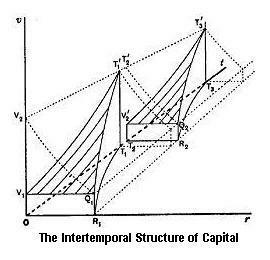 It was a full decade later that Hayek published The Pure Theory of Capital (1941), a long and tedious volume that incorporated some of those 3-D diagrams (such as the one shown here from p. 197). This book was intended to provide the theoretical undergirding for his early work on business cycles. A follow-on volume to have been titled The Dynamics of Capital (Hayek, 1983, p. 413) was never written. It is not difficult to imagine, though, that Dynamics would have been Prices and Production in full theoretical dress. After the Pure Theory, Hayek's interests shifted to the broader issues of his day. His milestone "Economics and Knowledge" (1937) was also a stepping stone from the economics of industrial fluctuations to the field of political philosophy. 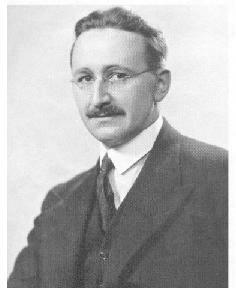 Hayek became widely known for his 1944 Road to Serfdom and for subsequent writings in the classical liberal tradition. In time, all his pre-Road work became widely ignored. And if acknowledged at all, his insights into the nature and significance of cyclical variation were dismissively dubbed Hayek's "technical economics." Harsh criticisms of the early Hayek�from his adversaries, his erstwhile defenders, and his political-science allies�are prevalent in the literature. Keynes (1931, p. 394) referred to Prices and Production as a "frightful muddle." Joan Robinson (1972, p. 2), referring explicitly to the triangles that punctuated Hayek's 1931 lectures, condemned his business cycle theory as a "pitiful state of confusion." Lionel Robbins, whose 1934 Great Depression was a skillful application of Hayekian theory to the boom and bust of the interwar period, recanted in his 1971 Autobiography (p. 154), confessing that he would "willingly see [his 1934 book] forgotten." Commenting on Hayek's "technical economics" during an interview (Ebenstein, 2001, p. 81), Milton Friedman emphasizes that he is "an enormous admirer of Hayek, but not for his economics. I think Prices and Production is a very flawed book. I think his capital theory book [The Pure Theory] is unreadable. On the other hand, The Road to Serfdom is one of the great books of our time." Ebenstein's biography provides only a brief and unsatisfying account of Hayek's early theorizing about business cycles. In a chapter titled "LSE," he writes that "Hayek's basic misconception of economic production was concerning the nature of capital" (p. 54). In a subsequent chapter titled "Capital," Ebenstein indicates that the essential aspect of Hayek's conception of a capital structure is that capital is heterogeneous. He then brings this episode of Hayekian thought to an abrupt end by noting that "If this empirical assumption of capital's heterogeneity is false, [Hayek's] theoretical system of economic activity falls" (p. 83). It is trivially true, of course, that homogeneous capital would imply the absence of structure and hence the irrelevance of any theory based on considerations of structure. Hayek considered it too obvious to have to prove that there is a capital structure�a structure that can be modified but not instantly and not costlessly. The costs of restructuring capital are easily absorbed during a policy-induced boom when credit is cheap and profit expectations are high. But after the bust, the costs of undoing the misallocations caused by unduly cheap credit take the forms of business losses, bankruptcies, and unemployment. Hayek's conception of the production process entails a temporal sequence of activities that transform inputs into consumable output. Capital of various sorts�plant and equipment, tools and machinery, raw materials and goods in process�are put to use in the various stages of production. The structure of capital, then, is defined in terms of this temporal arrangement of heterogeneous capital goods. For pedagogical purposes, Hayek divides the economy's production process into a finite number of stages, such that the output of one stage constitutes the input of the next�with the final stage yielding consumable output. Though simplistic, the notion of a sequence of stages served the purpose of incorporating into his theorizing the time element of the production process. This, then, is the significance of the capital structure�and of those 3-D diagrams: Capital structure captures the time element. The analytically simplest way to deal with production time is the Hayekian triangle�a right triangle in which the stages of production are arrayed along the horizontal leg and the market value of the final output is represented by the height of the vertical leg. Capital restructuring, as might be induced by a change in the rate of interest, is represented by a change in the shape of the triangle. In hindsight, we might make the judgment that the simplicity of the Hayekian triangle is its greatest virtue. Not long after Hayek delivered the 1931 lectures, however, he became aware of all the modifications and qualifications that would be required for his analytics to capture the many features of the economy's capital structure and hence to better serve as a basis for theorizing about the production process. But actually making those modifications and qualifications�that is, writing The Pure Theory of Capital�did not have the intended effect of strengthening his analytical framework; rather it had the effect of weakening his stature and credibility on the issues of money and business cycles. Keynes, we can imagine, could have set out to do something similar. His Chapters 6 and 7 of the General Theory ("The Definition of Income, Saving and Investment" and "The Meaning of Saving and Investment") could well have been elaborated into a book-length, pure-theory treatment complete with some very complicated diagrams depicting all the interconnected stocks and flows. Instead, the qualifications, nuances, and imponderables acknowledged in those chapters were set aside in favor of the simple circular flow of income and expenditures. For driving home the basics of macroeconomics, simplest is best. The time-consuming production process that lies at the root of Hayek's analytical framework stands in stark contrast with the circular flow that lies at the root of Keynes's. This contrast is perfectly and memorably symbolized by the Hayekian triangle and the Keynesian circle. For Keynes, the time element�the period of analysis�is an arbitrary accounting period, conventionally taken to be one year. What matters for him is the relationship within any given period between earning money and spending it. Time in a more substantive sense comes into play only as expectations about the level of expenditures in future periods. The circularity�in both the circular flow of income and expenditures and the logic of the Keynesian system�readily lends itself to the conclusion that expectations are self-fulfilling and that market economies are unstable. The only two auxiliary propositions needed�both supplied by Keynes�is that expectations about the profitability of current investment spending are essentially baseless and that those expectations are subject to dramatic changes. The Hayekian triangle has its own logic�and one very different from that of the Keynesian circle. Hayek was able to show that the allocation of resources among the temporally sequenced stages of production corresponds to a particular temporal pattern of consumable output. If this resource allocation is consistent with the preferred pattern of consumption, then the ongoing economic activity (earning incomes by working in the various stages and spending those incomes on final-stage output) is sustainable. Further, ordinary market-driven movements in the rate of interest nudge the economy towards this internally consistent and temporally sustainable pattern of producing and consuming. The system is not inherently unstable. Hayek's theorizing was guided from the beginning by a critical methodological maxim: We must first explain how an economy can possibly work right before we can meaningfully ask what might go wrong. Hayek's theory of industrial fluctuations respected this maxim and followed straightforwardly as a matter of logic: If the interest rate is held below its market, or "natural," rate by credit expansion, the decisions of producers will be inconsistent with the preference of consumers. The economic expansion will be unsustainable. The boom will end in a bust. Only with a market-determined rate of interest can cyclical variations be avoided. The sharp difference between the Keynesian and Hayekian frameworks would have been fairly easy for Hayek to exploit in a review of Keynes's General Theory: Keynes's system is inherently unstable while Hayek's system is potentially stable but particularly vulnerable to the destabilizing pro-growth policies of the central bank. Though Hayek never actually reviewed Keynes's book, he does in fact argue in precisely this vein in the closing pages of his Pure Theory (p. 408), where he recognizes that money constitutes a "loose joint" in our modern complex credit structure: "But the existence of such a loose joint is no justification for concentrating attention on that loose joint and disregarding the rest of the mechanism, and still less for making the greatest possible use of the short-lived freedom from economic necessity which the existence of this loose joint permits." Though Hayek's account of boom and bust had an essential and compelling logic about it, his interests turned to other matters, beginning even before the publication of his book on capital. His 1937 article is commonly regarded as a major shift in his thinking�a shift that calls his own earlier work on industrial fluctuations into question. An alternative interpretation, however, is that Hayek became increasingly aware of the significance of the methodological maxim that he had always respected and that Keynes and many others had wantonly flouted. In the early LSE years Hayek was concerned with the question of how the market process had to operate if the preferences of consumers were to get transformed into the production plans of producers and how credit expansion could interfere with this process. In his later writings he was concerned with the question of how this same market process could in fact operate even though the information on which it is based is incomplete and dispersed throughout the economy. Hayek was fully aware of this second question well before his going to LSE. In fact, by his own account (Hayek, 1994, p. 1), he was already working with and under the influence of Mises when Mises's Socialism, which dealt at length with the issue of economic calculation, appeared in 1922. Hayek may have believed at this early point that the economics profession had or soon would understand the full significance of Mises's book. His own efforts, then, could focus on the intertemporal coordination made possible by unhampered credit markets and the intertemporal discoordination caused by misguided bank policy. If anything, the 1937 article marks Hayek's realization that the profession had in fact not absorbed Mises's insights at all. Hayek's fellow economists could not appreciate Prices and Production because they lacked a fundamental understanding of the market economy. In an attempt to overcome this obstacle, Hayek began to deal in a more explicit way with the coordination of individual plans on the basis of dispersed and incomplete information. With this alternative interpretation, Hayek's "technical economics" and his subsequent political philosophy can be seen as exhibiting a certain continuity of thought�the later phase involving more fundamental and even remedial concerns. This interpretation is consistent with Hayek's own retrospective offered in the foreword to Gerald O'Driscoll's Economics as a Coordination Problem: The Contributions of Friedrich A. Hayek (1977, p. ix): "That it seems in principle possible to recast a great part of economic theory in terms of the approach which I had found useful in dealing with such different problems as those of industrial fluctuations and the running of a socialist economy [is] gratifying to me.... Professor O'Driscoll has almost persuaded me that I ought to have continued with the work I had been doing in the 1930s and 1940s rather than let myself be drawn away to other problems which I felt to be more important." However much we admire Hayek's writings in political philosophy, we can still lament that "Mr. Fluctooations" didn't stay the course in his efforts to provide a full-fledged alternative to the emerging Keynesian orthodoxy. Ebenstein, Alan. (2001) Friedrich Hayek: A Biography. New York: St. Martin's Press. Hayek, F. A. (1931) Prices and Production. London: George Routledge and Sons, Ltd.
____(1937) "Economics and Knowledge," Economica, vol. 4 (new series), pp. 33-54. ____(1941) The Pure Theory of Capital, Chicago: University of Chicago Press. ____(1983) Interviews: "Nobel Prize-Winning Economist Friedrich A. von Hayek," Los Angeles: UCLA Oral History Program (spiral-bound manuscript). ____ (1994) Hayek on Hayek: An Autobiographical Dialogue, ed. by Ste[jem Lresge amd :eof Wemar. Chicago: University of Chicago Press. Keynes, John M. (1931) "The Pure Theory of Money: A Reply to Dr. Hayek," Econometrica, vol. 11 (November), pp. 387-397. ____ (1936) The General Theory of Employment, Interest, and Money. New York: Harcourt, Brace, and Company. Mises, Ludwig von. ( 1951) Socialism. New Haven: Yale University Press. O'Driscoll, Gerald, P., Jr. (1977) Economics as a Coordination Problem: The Contributions of Friedrich A. Hayek Kansas City: Sheed, Andrews, and McMeel, Inc.
Patinkin, Don and J. Clark Leith. (1978) Keynes, Cambridge and the General Theory. Toronto: University of Toronto Press. Robbins, Lionel, ( 1971) The Great Depression, Freeport, N. Y.: Books for Libraries Press. _____. (1971) Autobiography of an Economist. London: Macmillan. Robinson, Joan (1972) "The Second Crisis in Economic Theory," American Economic Review. vol. 62, nos. 1-2, pp. 1-10.